Recent release, “Penitentiary to the Streets” from Page Publishing author Tyrone Martin is both captivating and cultural; this work keeps the reader mesmerized by the actions of the main character. 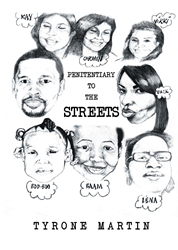 Tyrone Martin, a devoted writer and author, has completed his new book, “Penitentiary to the Streets”: a gripping and potent work based on a true story of one’s fight for justice and innocence. Published by New York City-based Page Publishing, Tyrone Martin’s passionate work details the courage of surviving a life sentence. “Penitentiary to the Streets” is based on a true story, following the struggles of a young man whose freedom is stripped away with the utterance of a lie. His fight to prove his innocence is in jeopardy of being thrown away, due to his anger and lack of his understanding of the justice system. With a life sentence, and no real hope, he must decide what means the most. Will he ever hold his children again, or will he become a fixture in corrupt prison forever? Readers who wish to experience this profound work can purchase “Penitentiary to the Streets” at bookstores everywhere, or online at the Apple iTunes store, Amazon, Google Play or Barnes and Noble.